I JUST WANT TO BE AN EQUAL IN CHURCH! 20-teeners, those in their 20’s & 30’s between the years 2013-1019 are relational, but they are expected to fit into an institutional church structure where hierarchy precedes relationship in prominence. It just isn’t working. The church is beginning to realize that truth, and they are baffled about what to do about it. The church thinks it is relational claiming we are “all one in Jesus Christ”, but its corporate institutional, pyramidal, hierarchal structure says differently. There is little if any flat world, flat lined, linear relational structure in most churches, thus turning off the 20-teeners. Churches have invested in a hierarchy of leadership that throughout its history has established a clergy/laity, a saints and ain’ts, those in and those out mentalities. When any institutional structure becomes administratively heavy, that institution faces trouble. Often downsizing by cutting middle management produces financial solvency, until another middle management rises with the institution’s new growth. Workers are asked to practice self-sacrifice for the sake of the institution. I’ve seen this principle in economic, political, education, and church institutional structures. Locally, I have recently seen it economically through Harley Davidson. Educationally teachers where I teach are taking “pay freezes” to save “administratively” financial blunders from bringing down our school system. Politically the fight over the deficit and budget cuts are effecting everyone. I am sure government will soon “ask the public to sacrifice” to get us out of their mess while they chose not to “sacrifice”. It will cost many “middle management” political jobs. I have also seen it at the church that I attend where the Senior Pastor and Administrative Pastor remained while the middle level, Youth Pastor & Children’s Pastors, were cut, as they now ask the congregation to “sacrifice” and fill those positions on a volunteer basis. I recently read in Isaiah 57:14: “And it will be said, ‘Build up, build up, prepare the road! Remove the obstacles out of the way of my people” causing me to pray, “what are these obstacles to the 20-teeners that we have created? This is what I discovered: 20-teeners think flat line, linear in their relationships. They function from an even playing field as seen in the way they communicate to each through social networking, the internet, and the world wide web. Friends are just friends, bloggers just bloggers, tweets, emails, and texts just another platform of communicating to each other linearly. They are looking to their generation for “level playing fields” that the older generations and their institutions are not affording them. What they do on that level field is still being played out, but the field is level. They certainly do not feel that level field when entering today’s churches. When they enter a church today, the worship leader tells them what to do and they are just expected to follow, sing his lineup of songs and just follow his order of worship. The Senior Pastor tells them what the Bible says rather than them searching for themselves. All they are expected to do is listen and accept what he says as truth because he is the Pastor. The elders are called upon to pray with you, give you counsel and advice that you are to blatantly follow because they are the leaders. You learn not to question anything because of their positions and that is just the way it is! The only “empowerment” of linear equality you are given is a chance to “finance” their institution by them “receiving” an offering which you have been told to prepare before you come. Other than that, there is nothing else you have to “prepare”, for those in position will do it for you, asking you to tag along so you feel the empowerment which you don’t have. Any horizontal relationship has hit a “bump”, through hierarchy: the worship leader leads because he is a better musician and singer and discerner of the spirit than you even though his services are scripted; you are to just follow his lead… a bump. The Pastor, definitely more “highly educated” in the Bible who he has studied Greek, Latin, and Hebrew and has done many an exegesis on Biblical passages, preaches his sermon which he has spent hours preparing while you have no preparation; you are expected to just sit and listen if you can stay awake… a bump. Elders, trained prayer teams to pray and counsel you after church again shows your inefficiency at prayer and solving your own problems since they are better qualified and trained…. Another bump! There are even more, but I have to watch the size of this blog. If you line up all these bumps, do you know what you have? 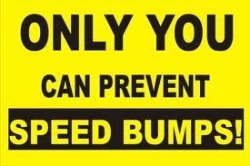 You have a rumble strip of speed bump! What do rumble strips and speed bumps do? They slow you down, and sometimes if the bumps are big enough, bring you to a halt. That is what religious, institutional speed bumps are doing to the 20-teeners, and we wonder why they are lethargic, nonresponsive, or have left the church! Newer PostCONTROL: “GIVE IT UP”? Older PostI JUST WANT AN EVEN PLAYING FIELD!